As we get into the habit of having to remember to take our ‘bags for life’ to the shops with us, it is worth remembering that the only true ‘bags for life’ are those made by premium luggage manufacturer Briggs & Riley; each and every product comes with a lifetime warranty that even covers airline damage (something no other company offers). The latest collection from Briggs & Riley is Sympatico which is the first Collection of suitcases to include accompanying tote bags in the same colours and style. The Sympatico Shopping Tote is the perfect bag when headed to your next destination. It completes your travel requirements by offering a stylish and easily accessible place to keep essentials on hand, with room to spare. Co-ordinating perfectly with a Sympatico spinner case, it is available in Black, Burgundy and Marine Blue and retails for £159. The Sympatico Weekender bag is the ultimate in smart overnight bags. The perfect size for packing absolutely everything you need for that extended stay yet light and casual. The bag also co-ordinates perfectly with a Sympatico spinner case. Only available in Black and the bag retails for £179. 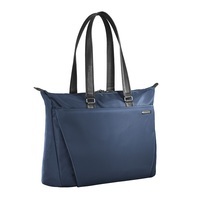 The Baseline Large Weekender is perfect for that short break away by car or plane. The spacious bag has ample space for packing a long weekend’s-worth of clothes and toiletries and can even expand to provide more room if required. In addition to the main storage space, there are both outside and inside side pockets for quick access to travel documents etc. Available in Black or Olive, it is made of tough, ballistic nylon to withstand tough travel conditions, and it retails for £169. The Baseline Extra Large Weekender is the perfect bag for a short break. It is essentially a large, roomy, travel satchel that provides the ultimate packing space (it even expands to give more room if needed). Made of durable ballistic nylon, it has a large main compartment, a zippered pocket and 2 elastic pockets to organise smaller items like ties and scarves. It also has a handy external pocket for keeping items needed in a hurry, for example at an airport check in. It is available in black or olive and retails for £189. Briggs & Riley products are available online at johnlewis.com, at selected John Lewis Branches, Harrods, Selfridges, Case London and leading independent retailers (a full list can be found at briggs-riley.com/luggage-stores/international).